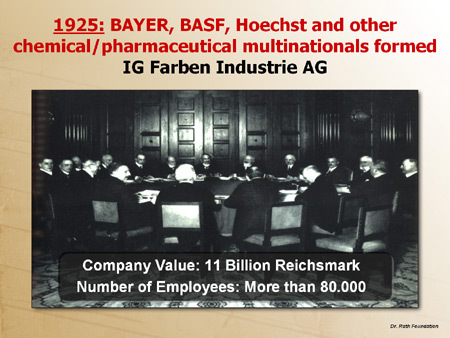 One of the strategic industries for which IG Farben sought global control was the pharmaceutical “investment business”. They knew that the pharmaceutical industry is not primarily a health industry, but an investment business that defines the human body as its marketplace. 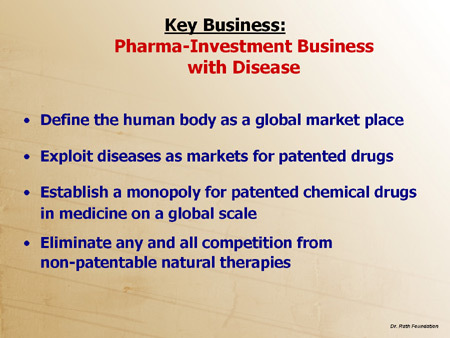 While presenting itself as the purveyor of health, the entire existence of this investment industry has been based on the continuation and expansion of diseases as multi-billion dollar markets for patented drugs. 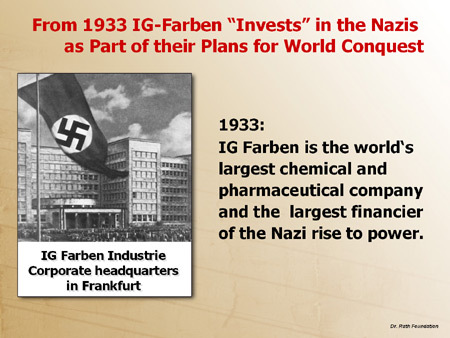 In 1933 IG Farben became the largest financier of the Nazis rise to power. 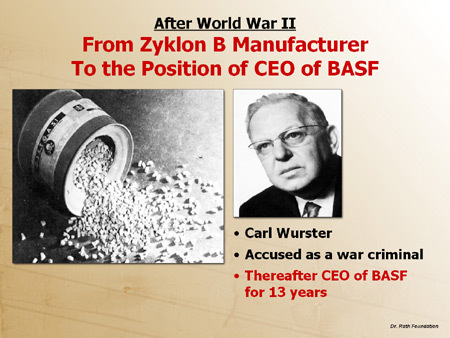 And in the following years, this German chemical/pharmaceutical cartel became the corporate accomplices in the preparations for the military conquest of Europe. 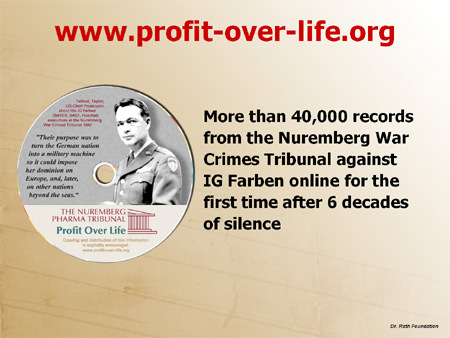 The records of the Nuremberg War Crimes Tribunal document that Bayer, BASF and Hoechst gave more than 80 million Reichsmark to the Nazis and their sub-organizations. 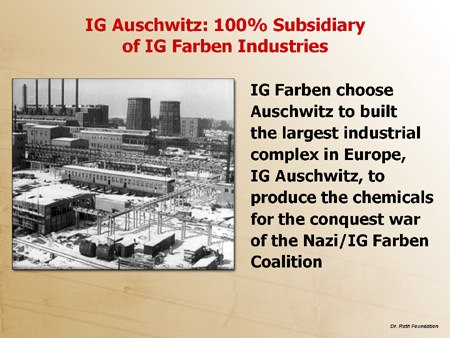 In return for this “investment,” IG Farben took over the chemical, pharmaceutical and petrochemical industries in the countries occupied during WWII with the ultimate goal to create and dominate a “European Market” from Lisbon to Sofia. 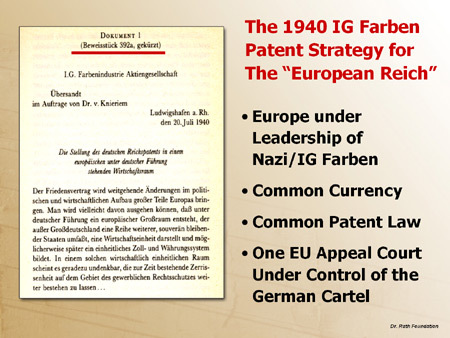 The 1940 IG Farben Patent for the "European Reich"
In Auschwitz , IG Farben built the largest industrial complex in Europe to produce the chemicals and explosives for the WWII Eastern front. This 24 square kilometres industrial complex - as well as the massive expansion of the nearby concentration camps as a reservoir of slave labour - was financed with credits of almost one billion Reichsmark by Deutsche Bank. 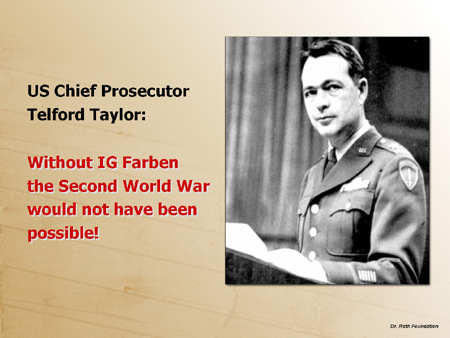 US Chief Prosecutor Telford Taylor: Without IG Farben, the Second World War would not have been possible! 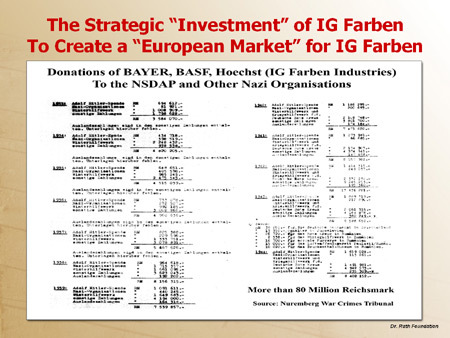 US Prosecutor Telford Taylor summarised the role of this chemical cartel during the Nuremberg Tribunal in the following way: without IG Farben, the Second World War would not have been possible. 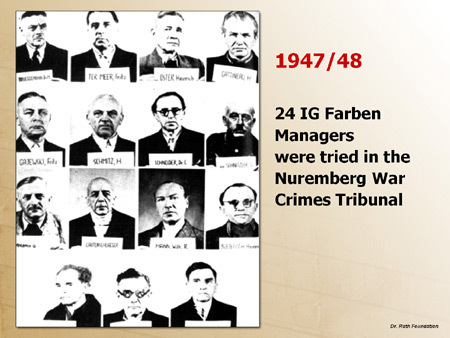 For six long decades, the records of the Nuremberg Tribunal against the managers of the IG Farben Cartel were hidden away in archives. In July this year, our foundation got access to these files and published over 40,000 pages of this important tribunal on the Internet. From now on, everyone, school children and adults alike, can read and study these important documents online anywhere in the world. 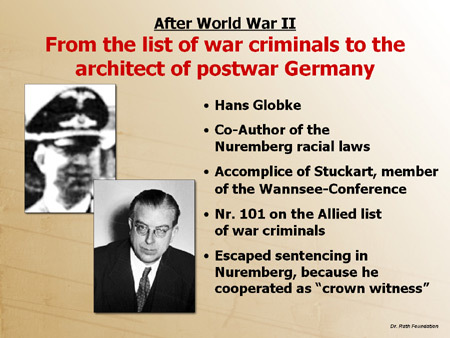 Hans Globke had been a co-author of the Nuremberg racial laws and had also been responsible for writing the new laws of the Greater European “Reich” in the countries occupied by the Nazis during World War II. 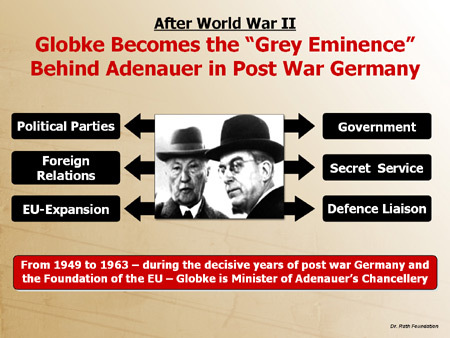 After the Second World War Globke became minister of the Chancellery in German Chancellor Adenauer’s office. 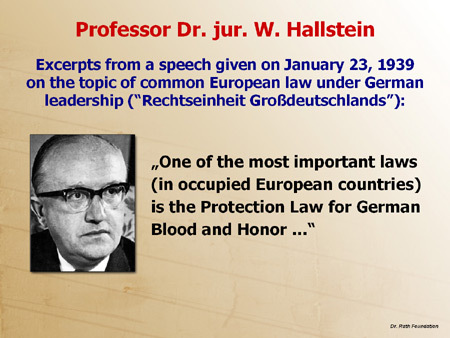 As the “grey eminence” and outside of any parliamentary supervision, he controlled essentially all aspects of political life in postwar West-Germany from the Secret Service to the continuation of the plans of the oil and drug cartel to conquer Europe under the newly constructed EU. 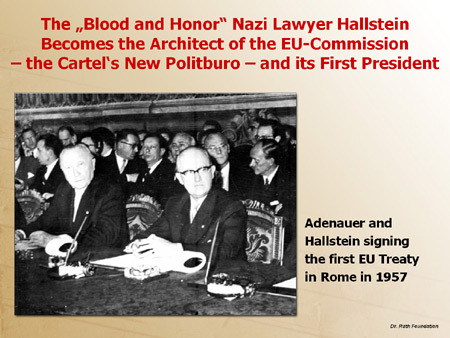 In 1957 the same “blood and honour” lawyer became the key architect of the European Union’s basic structure and the first head of the “European Commission” – the executive body of the EU designed from the beginning to rule Europe outside any democratic control. 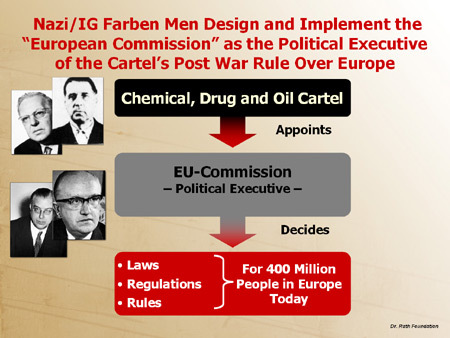 In summary, Nazi and IG Farben men designed the European Commission as the “Politburo” of the Pharma Cartel’s post-war rule over Europe. 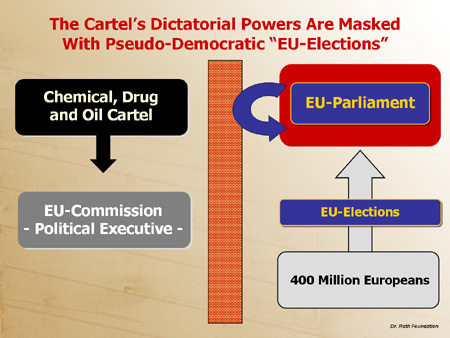 The Cartel's Dictatorial Powers are Masked with Pseudo-Democratic "EU Elections"
As a direct result of the influence of these interests, the decisions of the European Parliament have little, if any, influence on the laws and on the so-called “EU directives” imposed by the “EU Commission” on the lives of 400 million people in Europe. 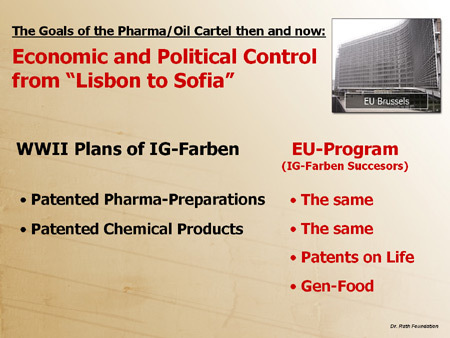 The Goals of the Pharma/Oil Cartel Then and Now: Economic and Political Control from "Lisbon to Sofia"
Today, the shadows of IG Farben are still lingering over Europe. The goals of the IG Farben successors are today joined by oil and drug multinationals from other European countries. 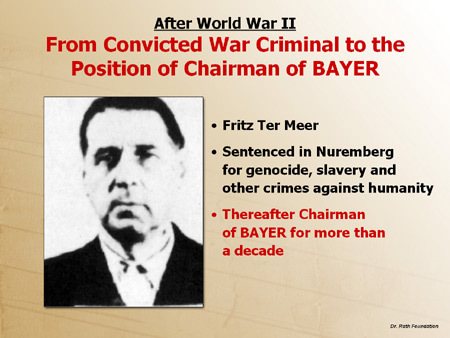 But their goals remain the very same as those of IG Farben during WWII: to establish and control a European market from “ Lisbon to Sofia ” with patented pharmaceutical drugs and other patentable high-tech products. 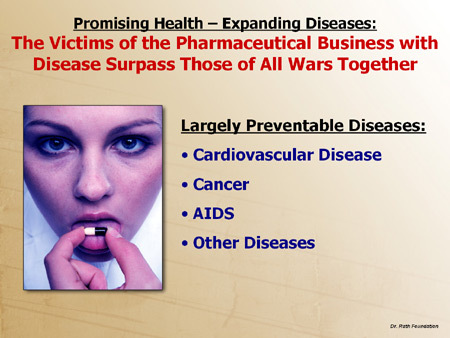 The most well-known among those industries that seek control over our lives is the pharmaceutical “business with disease”. As mentioned before, this industry is based on the promise of health, but its entire existence depends on promoting diseases as markets. We know today that cardiovascular disease, cancer, immune deficiencies and other diseases are largely preventable. 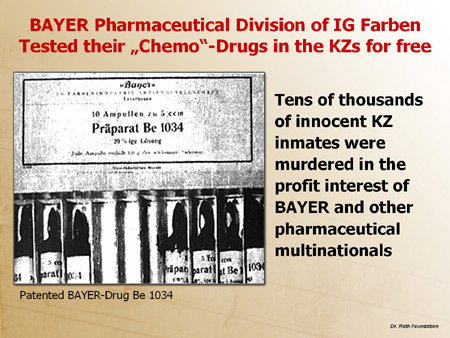 Their deliberate continuation for a corporate gain of the pharmaceutical drug business is a crime. 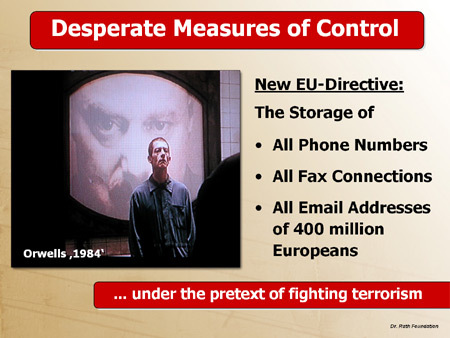 Under the pretext of fighting terrorism, the very same EU Commission has just issued a directive that will turn Europe into an “Orwellian continent”. According to this EU-directive, from now on all telephone numbers you will call, all Email addresses you will contact will be stored. 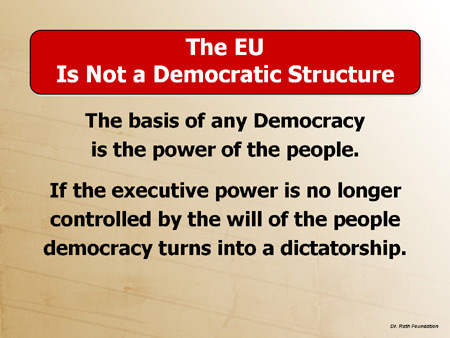 And not only from you but for 400 million people across Europe. It is not hard to understand what these tools mean in the hands of those interest groups that have so often abused their power in the past.